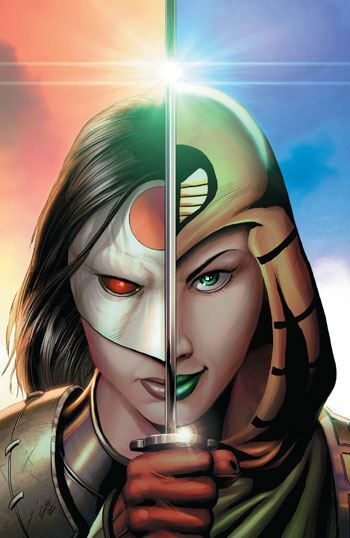 Katana and Suicide Squad Black return for the second chapters in their stories, in the latest issue of Suicide Squad Black Files. Of the two stories, I have to admit to preferring the second one. But that is not much of a slight to the Katana tale. It’s just that Katana is not a character I find particularly exciting. But I am enjoying her storyline in this book. For one thing, Kobra is the villain. That always works, and they have a history together now. But far more than Kobra, what is drawing me into this tale is Halo. I hadn’t realized that Halo had been re-introduced in a Katana miniseries, so I am grateful that this issue has a note pointing that out. Halo gives Katana someone to care about, bringing out her softer side, and also makes a great lure for Kobra. I am loving the new costume that Halo has been given, as well. May as well just admit it, for me, the Katana story is really a Halo story. But I also have to admit that the Suicide Squad Black story all but pushed the Katana one right out of my mind. The story is superb, with a great cast of characters, and Scot Eaton’s art makes the most of it. The Squad head off on their mission against Faust, but get diverted to Gemworld, running into a villain not seen in more than a decade. This is such a great story. I was pleased with the first chapter. By the end of this one, I was wanting this version of the team to get their own book. Why not? Justice League Dark has their own book, and Suicide Squad Black is proving to be just as fun, with just as wild a cast. So even if the Katana story fails to hold my interest in the long run, I have no doubt that the Suicide Squad Black story will easily carry me to the end of the miniseries.